More projections are now supported in the Weather Assistant tool. 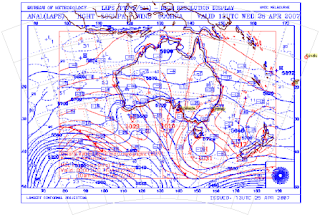 Lambert is one of them, used by the Aussie's Bureau of Meteorology. The image on the left illustrates that feature. It seems that the surface charts and the 500mb ones are using slightly different parameters (like contact parallel) for their charts. Anyway, that is useful to have this one supported. Beside that, we now have the concept of pattern supported. It gives you the possibility to reuse the parameters of a composite for another one. For example, you have created a composite for the North Pacific, with a surface chart, a 500mb one, with a chart on top of it. You can create a "pattern" out of it, and when you will "Load with Pattern..." from the menu, you will be prompted for the faxes, but all the size, position and scale parameters will remain the same. Makes the creation process for the composite much faster.